A toy wagon is a four-wheeled toy consisting of a main body section and a steering handle. It is produced by a semi-continuous method, which involves making, painting, and assembling the various parts. First introduced as a toy in the 1880s, the basic wagon design has changed little over the years. The best evidence suggests that wagons were first developed during the middle of the fourth century B.C. in Mesopotamia. These wagons were used for transporting various agriculture and building supplies. During the ancient Roman times, a major technical advancement was introduced which made wagons more useful. This was the invention of the pivoting front axle, which provided better steering and turning capabilities. The toy wagon was first produced in the 1880s. These early toys were handcrafted and made completely of wood. Over the years, steel and plastic replaced wood as the material of choice. The most famous toy red wagon is produced by Radio Flyer Incorporated, a company was started by Antonio Pasin just before the 1920s. He was a crafts-man who immigrated to the United States from Italy. The first wagons he produced by hand but soon found that the process was too slow to keep up with demand. When he adapted metal-stamping technology that was developed for the auto industry to his wagon business, he was able to produce large quantities daily. By the 1930s, his company was the world's largest producer of coaster wagons. Wagon production was slowed during World War II because steel used for non-war-related goods was rationed by the government. After the war however, the demand for wagons reached record levels and the company was back on track. Over the years, the manufacturer has continued to make minor improvements in the design of the wagon, which make them safer and more versatile toys. The typical toy wagon is made up of a main body portion, an undercarriage, wheels, and a steering handle. This design has changed little over the last hundred years. The main body is the riding or hauling part of the wagon. It is usually rectangular in shape. It has a flat bottom with walls on all sides and an open top. The height of the wagon walls is variable depending on the model type. In steel wagons, the top edges of the walls are curled under to prevent injury. Additionally, the corners are rounded for the same reason. The wagon body is rated for a maximum payload. Novel wagon bodies are also produced with such features as removable walls and storage areas. The undercarriage provides support and an interface between the main body and the wheels. It is made up of support brackets and the wheel axles. The back axle is affixed to the wagon body and lets the wheels move in only one direction. The front axle is attached to a pivoting mechanism, which is fixed to the wagon body. This allows the direction of these wheels to be rotated. On both axles, the wheels are attached through a ball bearing system, which ensures that they will freely rotate. The ball bearings are made of plastic and require occasional lubrication. The wheels come in various sizes and generally, larger wheels are needed for wagons that have a large load capacity. Some wagons have a braking mechanism, which slows or locks the wheels in place. The steering handle is a long steel or plastic rod, which extends out from the front of the wagon. At the end of the rod is a handle, which is perpendicular to it. Newer designs have been developed since the traditional handle causes some discomfort. The entire steering device is attached to the front wheel assembly through a ball joint. This enables children, or cargo, to be pulled in the wagon's main body while providing a method for steering. For safety reasons, the turning radius of the wagon is limited to prevent the wagon from tipping over. The steering handle can be lifted up or down depending on the height of the operator. In some wagon models, the steering handle can be pulled or lifted up for operation by the passenger. All of the parts of the wagon are attached via screws, nuts, bolts, and various welds. A variety of raw materials are used to produce toy wagons. The main body and other parts of the wagon can be constructed from steel, wood, or plastic. When wagons were first produced as toys, they were constructed almost entirely out of wood. Some wagons are still made this way, however steel has largely replaced wood as the material of choice since it is stronger and more durable. The steel that is now used is a soft, draw quality material which is lightweight and sturdy. Plastic wagons made of high-density polyethylene (HDPE) are a relatively recent development and are a result of improvements in polymer technology. To put the finishing touches on the wagon, other materials are used. Acrylic-based paints that are durable and non-toxic are used to decorate the main body and other wagon parts. Common colors include red, black, and white. To change the properties of the plastic and make them easier to work with, fillers are often added. Additionally, colorants are added to the plastic for decorative purposes. Finally, rubber is used for making the tires. The parts of a toy wagon are made using a variety of methods such as metalworking, plastic molding, and die-casting. The pieces can then be assembled by the manufacturer or packaged and sold for home assembly. The exact manufacturing method depends on the material of the final wagon. In this section, the method for producing a steel red wagon will be discussed. 1 The wagon body is produced using a drawn steel stamping process. The sheet metal used for making the wagon body is supplied to the manufacturer rolled up in large coils. The coils are put on a de-spooling device, and the steel is fed through a powered straightener to the production line. The straightener ensures that the steel will have no kinks or twists. On the production line, the steel is moved to the cutting machine, which fashions it into rectangular sheets, which have the proper dimensions. The scrap steel is collected and recycled for later use. 2 The cut steel is conveyored to the molding station. Here, it is forced into a molded cavity, or die, by a high-pressure press. The press is then lifted, and the part is ejected from the die. At this point, it generally conforms to the size and shape of the wagon body. The body is next moved through a trimming device, which cuts off any excess steel. Then it is moved to a crimping machine, which grabs the top edges and rolls them under. This eliminates any sharp edges that might remain. Depending on the wagon type, the body may be welded to make it further reinforced. The wagon body is produced using a drown steel stamping process. The steel is cut into rectangular sheets, which have the proper dimensions, and then molded into the shape of the wagon body. paint. Finally, the bodies are moved through a large oven, and the paint is baked on. As they exit the oven, a stenciling machine is used to label the wagon. This entire coating process takes about 30 minutes. 4 The other wagon parts are made in a variety of ways. The wheels are made with steel and rubber. Just like the wagon body, the steel for the wheels are cut to the appropriate size and shape. In this case, circular steel shapes are used. After cutting, the steel is pressed to give it a bowl shape. Two of these steel bowls are welded together to form the rim of a single wheel. The wheel rim is painted, and after it dries a rubber tire is put on. Additional steel parts, such as the axles, undercarriage, and steering handle, are also made by using a metal stamping process. Cutting, welding, and painting complete the production of these parts. 5 The plastic parts are made using an injection molding process. This requires a machine, which converts plastic pellets into finished parts. The pellets are first melted and then physically injected into a two-piece mold. Inside the mold, the plastic is held under pressure for the required length of time and then cooled. As it cools, the plastic hardens. The mold is opened and the piece is ejected. 6 When all of the pieces are ready, they are moved to a packing area. For pre-assembled wagons, trained workers put each of the wagon pieces together. The wagon is then covered in plastic and sealed in a box. If the product is sold unassembled, the parts are put in a box. 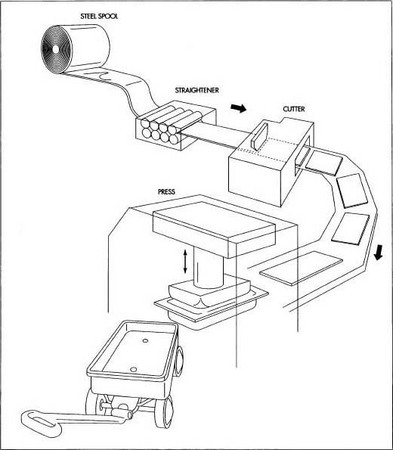 In this process, a cardboard box is put on a continuous belt and workers place the various parts in the box as it passes by. The box is then sealed and then put on a pallet. It is then ready to be shipped from the plant to the local toy store. The toy industry is directed by specific governmental regulations related to toy safety. Therefore, quality control is an important part of production. It begins with an inspection of the incoming raw materials and any finished parts that are used to produce the wagon. This includes such things as the steel, plastic resin, and paints. During various phases of production, visual inspections of parts, welds, and painting are performed by trained quality control technicians. Parts may be rejected if they are significantly damaged. In such cases, the part is removed from the production line and the steel or plastic is recycled. Future developments in wagon production will likely be in the areas of wagon design and increased production speed. Companies such as Radio Flyer continue to receive patents on their new wagon designs. For example, a recent patent describes a toy wagon which has additional storage capacity built in. Another patent describes a wagon, which has a steering handle that is easier to pull. Future designs will have improved safety features or other novel design elements. From a manufacturing standpoint, improvements in steel and plastic technology should be adapted to increase production speed and make the process more automated. Computer design will undoubtedly play a bigger role. Panquin, J.R and R.E. Crowley. Die Design Fundamentals. Industrial Press Inc., 1987. Seymour, R. and C. Carraher. Polymer Chemistry. Marcel Dekker Inc., 1992. Smith, David. Quick Die Change. Society of Manufacturing Engineers, 1991. "Little Red Wagon: Easy to Build & Easy to Love." The Family Handyman (November 1992). Pasin et. al. United States Patent #5,538,267, 1996. Radio Flyer Inc. Grand Ave, Chicago IL 60639. (800) 621-7613.
von Braucke et. al. United States Patent #5,529,323, 1996.